Brett Kimberlin’s life has been filled with grandiose schemes that backfired. His pseudo-black-op cover story for his dope smuggling failed, resulting in his first multiyear sentence. His attempts to use bombings to divert police energy from a murder investigation ran his prison time up to double digits. His attempts to use lawfare to stop truthful reporting about who he is and what he is doing resulted in expanded attention to who he is and what he is doing. The TKPOTD points out one of the core reasons for the failure of his lawfare. The Dread Pro-Se Kimberlin has been given until close of business this Friday to file any further amendments to his complaint in the Kimberlin v. The Universe, et al. RICO Madness. One reason he wishes to do so is that so much of his existing amended complaint has been gutted by the various motions to dismiss. As we wait this week for TDPK’s latest magnum opus, let’s review some of the better bits from those motions to dismiss. Since this is my blog, I’ll start with my discussion of the deficiencies in his allegations of defamation. 32. Plaintiff is a public figure who is defamation proof. He became the object of public attention when he was tried and convicted as the Speedway Bomber. See U.S. v. Kimberlin, 527 F.Supp. 1010 (S.D. Ind. 1981) and 483 F.Supp. 350 (S.D. Ind. 1979). He broadened his fame when, while still in prison on bombing and drug smuggling charges, he claimed to have sold marijuana to then-Vice-Presidential-candidate Dan Quayle. See Kimberlin v. Quinlan, 6 F.3d 789, 791 (D.C. Cir. 1999). Further public interest was generated when his parole for the bombing and drug charges was revoked. Kimberlin v. Dewalt, 12 F.Supp.2d 487 (D. Md. 1998). It was revoked because of failure to make restitution to the widow of a bombing victim (herself a wounded victim) which was a condition of his parole. He achieved another measure of fame when he sued the Bureau of Prisons because he was not allowed to possess an electric guitar in prison. See Kimberlin v. U.S. Dept. of Justice, 318 F.3d 228 (D.C. Cir. 2003). As a public figure, he has not alleged any instance demonstrating actual malice or a reckless disregard for the truth by any of the defendants. NYT v. Sullivan, 376 U.S. 254 (1964). 33. As can be seen by the partial listing of Plaintiffs history in the paragraph above, he has considerable reputational baggage. Citizen K: The Deeply Weird American Journey of Brett Kimberlin (Singer, Mark, Knoff, New York, 1996.) is an authorized biography of Kimberlin. It insinuates that Plaintiff had an improper relationship with a ten year old girl (p. 78. ), that he was suspected of having arranged the murder-for-hire of the girl’s grandmother. (pp. 82, 83. ), and that the subsequent Speedway Bombings were an attempt to distract the murder investigation (p. 89.). The book tells of other unsavory actions, including Plaintiffs bragging about sabotaging military equipment while working in a prison industry (p. 184.). Plaintiffs status as public figure is not unlike Nathan Leopold’s (of Leopold and Loeb); when one commits a sufficiently infamous crime, one becomes a public figure from that day onward. See Leopold v. Levin, 45 Il1.2d 434 (1970). 34. In paragraph 181 of the Amended Complaint Plaintiff alleges that statements by the defendants concerning his behavior make him appear “odious, infamous, and/or frightening” without, as noted above, alleging which particular statement(s) by which particular defendant(s) were defamatory. However, Plaintiff in the past has tacitly acknowledged his reputation (as a perjurer, drug smuggler/wholesaler/dealer, bomber, murder suspect, etc.) is bad. See e.g., U.S. v. Kimberlin, 805 F. 2d 210, 223-24 (7th Cir. 1986). Indeed, it is so bad as to render him defamation proof. See Jackson v. Longscope, 394 Mass. 577 (1985). There was one other problem with his allegation of defamation against me. 31. Even if the alleged statements made by Defendant Hoge be defamatory, any claim by Plaintiff is barred by the statute of limitations (Md Courts & Judicial Proc. 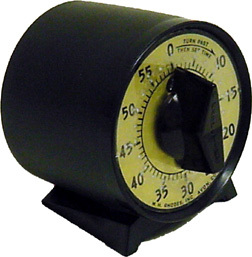 § 5-105.) because all alleged statements by Mr. Hoge were made more than one year before the filing of the instant suit. It won’t matter how he amends his complaint. Brett Kimberlin is a convicted serial bomber, and, like other serial bombers (The Unibomber Ted Kaczynski, for instance), he’s now known as a notorious criminal. He’s defamation proof. 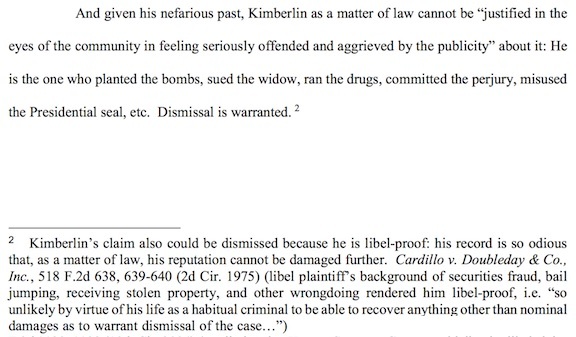 IANAL, but my opinion that Kimberlin is defamation proof was confirmed. The defamation claim in the RICO Madness LOLsuit was based in state law, so when Judge Hazel dismissed the federal claims in that case for failure to state a claim upon which relief could be granted, he dismissed the state claims for lack of jurisdiction. However, when The Dread Deadbeat Pro-Se Kimberlin filed them as the RICO Retread LOLsuit in state court, Judge Mason dismissed them for failure to state a claim, and one of the bases for that failure with respect to defamation was a finding that Kimberlin is, as a matter of law, defamation proof. In the process of losing the RICO Remnant LOLsuit, TDPK most likely destroyed any possibility of winning another defamation case. Folks just finding this blog are sometimes confused by the ongoing coverage of Brett Kimberlin and his minions. This TKPOTD from four years ago provides some historical perspective. The Gentle Reader should note that it was written after Kimberlin had lost the first state LOLsuit, but before any of the follow on federal or state cases had been resolved. Every once in a while, I find it useful to present a review of some of the names used for Brett Kimberlin and Team Kimberlin and how they have evolved. After all, not all the Gentle Readers have been following The Saga since May, 2012, as I have. Back in May, 2012, Brett Kimberlin had secured an unconstitutional gag order against Aaron Walker that prohibited Aaron from even speaking or writing about Kimberlin publicly. I began referring to Kimberlin as Lord Voldemort (i.e., “He who must not be named”) and his supporters as Death Eater Wannabes. 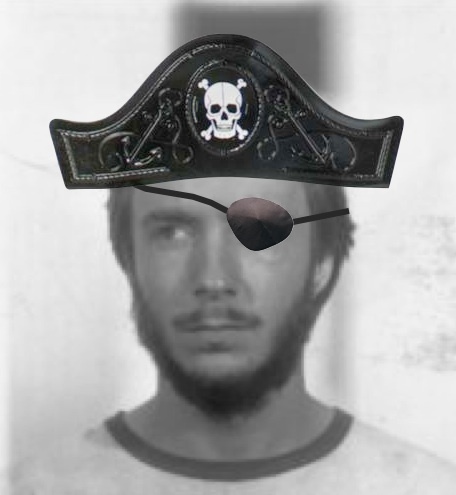 After the gag order was overturned, it wasn’t long before Kimberlin put up a pirate-themed fundraising website called the Bloggers Offense Fund. (That was an attempt to play on the name of a site called the Bloggers Defense Fund.) That’s when I began referring to Kimberlin as The Dread Pirate Kimberlin. Various members of Team Kimberlin have earned positions on the crew. These include First Mate Neal Rauhauser, Cabin Boy Bill Schmalfeldt™, Very Ordinary Seaman Ferguson, Chief Pedo Officer Gillette, and 57F Osborne. In mid 2013, Kimberlin upped the ante in his campaign of lawfare. He filed suit against Aaron Walker, Stacy McCain, Ali Akbar, Kimberlin Unmasked, and me. He sued us in a Maryland state court for $1,000,000 claiming a bunch of stuff that boiled down to defamation and false light invasion of privacy in the end. Following the Team Kimberlin lawfare strategy, TDPK sued us without hiring a lawyer. Self-representation is referred to a acting pro se. Thus, The Dread Pirate Kimberlin morphed into The Dread Pro-Se Kimberlin. TDPK has also been referred to as The Dread Pedo Kimberlin and The Dread Performer Kimberlin in reference to the charges filed against him by his wife and to his singing, respectively. The Dread Pirate Roberts, so the story goes, is a pirate of near-mythical reputation, someone feared across the seven seas for his ruthlessness and swordfighting prowess, and who is well known for taking no prisoners. Ships immediately surrender and give up their cargos rather than be captured, a fate they imagine to be certain death. It turns out that Dread Pirate Kimberlin’s legal acumen seems to be as fictional as Dread Pirate Roberts’ existence. And no one will surrender to Dread Pirate Kimberlin. UPDATE—As Ron Coleman notes in his comment below, some of the defendants in the RICO Madness have surrendered to TDPK. However, most have not. Four of us beat him in state court. The same four and our codefendants will also beat him in federal court. I should make several follow up comments. First, The Dread Deadbeat Pro-Se Kimberlin lost every single civil case he filed and saw every single criminal complaint he filed dropped. Second, he morphed from Dread to Deadbeat by not paying any of the sanctions imposed against him or costs taxed to him. Third, Ron Coleman and his co-counsel Bruce Godfrey followed through with their pro bono representation of blogger Patrick Frey, winning a summary judgment in the defendant’s favor on Kimberlin’s civil rights claim against Patterico. The biggest problem that Team Kimberlin has had with their LOLsuits is their lack of understanding about how to plead the who, what, when, and where of the various elements of the torts they have alleged. The TKPOTD from three years ago today dealt with The Dread Deadbeat Pro-Se Kimberlin’s inability to properly allege anything against me in the RICO Retread LOLsuit. I originally wasn’t the central character in the Dread Pro-Se Kimberlin’s RICO Retread LOLsuit in the Circuit Court for Montgomery County, but after the hearing on 3 September, 2015, TDPK moved me to the center of the alleged conspiracy. Here’s why. THE COURT: Okay, so what I will do is I’m not going to rule or decide your motion one way or the other, because as it’s currently pled I think it’s insufficient for me to decide whether he’s got a claim against Hoge or not. So I’m going to allow him to amend as to Mr. Hoge to see if he can allege something specifically that he has done without and actually I won’t decide this one way or the other. So we’ll just wait until he files his amended complaint and then I’ll take up well actually I guess you have to refile it as to the amended complaint. But I’ll leave this for the time being sitting here because if I dismiss the complaint as you then everything else goes automatically and we might as well dispose of some of these other things that we have this morning. MR. OSTRONIC [My Lawyer]: Do you have a time, Your Honor? THE COURT: Fifteen days ought to be — I mean, this has been kicking around for years. MR. KIMBERLIN: Yeah, that’s fine. THE COURT: Okay, so you’ve got 15 days. THE COURT: But keep in mind it can’t be complaints to officials requesting investigation. THE COURT: It can’t be coming to court. MR. KIMBERLIN: Some new crime. MR. OSTRONIC: Your Honor, will it also have to be conspiratorial? MR. OSTRONIC: It has to be conspiracy too, correct, he has to allege the elements of conspiracy? MR. OSTRONIC: Then this wouldn’t be the proper venue. THE COURT: Well, if he has anybody else that he can tie to that. I mean, if there’s more than one defendant he can make that argument, okay. MR. OSTRONIC: Thank you, Your Honor. THE COURT: Yes, I mean if all you’re left with is Mr. Hoge, he’s right, then you’ve got to go to Carroll County. His amended complaint was pretty slipshod. We’ll see what the court thinks of it soon enough. In some ways TDPK’s amended complaint was worse than his original. Every one of his allegations against me involved my asking the authorities to conduct an investigation, an my expression of protected opinion, or something barred by res judicata because of the previous Kimberlin v. Walker, et al. LOLsuit. In fact, the suit wound up being dismissed against me on the basis of res judicata. TDPK once claimed in an email to Patrick Frey that he had filed over a hundred lawsuits. He lost the vast majority of them. The Dread Deadbeat Pro-Se Kimberlin has constantly whined about the “false narratives” being used to defame him. In reality, his LOLsuits have been nothing but made-up stories spun without any supporting evidence. The TKPOTD from four years ago today cited one example. The Dread Pro-Se Kimberlin has about two-and-a-half weeks left to try to find enough well-plead allegations in his second amended complaint to cobble together the elements of at least one of the counts for his Kimberlin v. The Universe, et al. RICO Madness. If he wants to keep me as a defendant, he has to make one of the three federal claims work. That’s because he and I are both residents of Maryland, and he can’t sue me in federal court if all he has are state law claims. So what? FBI agents interview people all the time. Considering that three people, Patrick Frey, Erick Erickson, and Aaron Walker, who had criticized Brett Kimberlin or beat him in court had been SWATted, asking TDPK what he might know about the situation was not an unreasonable thing for someone investigating those SWATtings to do. TDPK has whined a lot about “false narratives,” but he’s never specified which defendant said what when to whom in any way that actually accused him of being the SWATter. That’s not in his original, first amended, or second amended complaints. He’s not supposed to get any more amendments, so it’s too late to change his tale. Time is ticking down. Of course, he could just dismiss the suit, but his ego probably won’t permit that. Of course, the federal counts Kimberlin’s RICO Madness LOLsuit were dismissed against me for failure to state a claim upon which relief could be granted, and his follow state RICO Retread LOLsuit was dismissed for the same reason. False narratives. I wonder how TDPK would characterize the bogus documents he bought for $9,000 back in 2017. UPDATE—Oh, look! Mr. Down Twinkles is back and has hit the Thumbs Down button. Perhaps one of the reasons that The Dread Deadbeat Pro-Se Kimberlin has been slacking off on his promise of lawsuits “for the rest of their lives” against the original defendants in the Kimberlin v. Walker, et al. nuisance LOLsuit is that he’s figured out that he can’t beat us. After he made the mistake of calling Stacy McCain as witness in the first LOLsuit (never try to outcrazy Stacy McCain), he dropped Stacy from the cases filed after August, 2014. After he lost both the federal and state Kimberlin v. National Bloggers Club, et al. RICO Madness and RICO Retread LOLsuits, he dropped Ali Alexander and Aaron Walker from further cases. Finally, after losing the Kimberlin v. Hunton & Williams, et al. RICO 2: Electric Boogaloo LOLsuit, he dropped me from the follow-on RICO 2 Retread state case. The RICO 2 Retread LOLsuit sputtered, and by this time a couple of years ago, it was on its last leg as was reported in the TKPOTD from two years ago today. The Dread Pro-Se Kimberlin has filed a motion seeking a postponement of the motions hearing scheduled for 15 November in the Kimberlin v. Hunton & Williams LLP, et al. (II) RICO 2 Retread LOLsuit. That’s the state version of the Team Themis LOLsuit filed in the Circuit Court for Montgomery County. The only remaining defendants are Bill Nickless, Battelle (the not-for-profit that runs Pacific Northwest National Labs for the Department of Energy), and some John Does. Judge Mason hasn’t granted his motion yet, so it looks as if the remaining motions to dismiss will be heard next week, and another of TDPK’s LOLsuits should bite the dust. We didn’t have to wait long. Not long thereafter, the case docket showed that Kimberlin had voluntarily dismissed the LOLsuit against those defendants. And then he failed to follow through with an appeal. Maybe he was lying when he promised lawsuits “for the rest of their lives.” He is a convicted perjurer, you know. The Dread Deadbeat Pro-Se Kimberlin’s campaign of lawfare as a form of brass knuckles reputation management has failed miserably. The TKPOTD from four years ago today shows how his LOLsuits claim that he had been defamed wound up getting a court to find that his reputation was so bad that there was no way to lower it. Judge Mason agreed with Michelle Malkin and Twitchy. He adopted their argument in dismissing them from the case. Thus, we now have a ruling finding that Brett Kimberlin is defamation proof. It would be interesting to know how TDPK evaluates the success and cost/benefit ratio of his brass knuckles reputation management now. Come to think of it, is there any member of Team Kimberlin who isn’t defamation proof?